There are many different ways to cook food and undoubtedly grilling is a favourite for many. There can hardly be anyone who doesn’t like grilled food. If you thought that grilling is a job that is best left to the professionals, you thought wrong! With the range of great quality grills that are available these days, grilling can be done in the comfort of your own home easily. One of the most popular grills that is available in the market today is the Weber Spirit E310 Natural Gas Grill which we will be reviewing in detail below. 3 What are the advantages of theWeber Spirit E310 Natural Gas Grill over its competitors? 4 Should you buy the Weber Spirit E310 Natural Gas Grill? Cast iron and porcelain enamelled cooking grates: Any cooking expert will vouch for the fact that cast iron cooking equipment gives great colour and sear to anything which is cooked in/on it. At the same time however, cast iron also needs a lot of seasoning before one can cook in it smoothly; else food tends to get stuck on it and then one needs to spend a lot of elbow grease scrubbing and scraping the remnants off. In the Weber Spirit E310 Natural Gas Grill, they have combined the best of both worlds by putting in cast iron grates that are porcelain enamelled. This means that while the grates will retain heat for a longer duration of time, they will tend to be less sticky and will not require as much seasoning as normal cast iron grates. They are also easy to clean and maintain. Porcelain enamelled Flavorizer bars: The signature flavour of grilled food is the smoky flavour that it imbibes from the grilling process. The porcelain enamelled Flavorizer bars that are present in the Weber Spirit E310 Natural Gas Grill, does this job effectively. The bars are placed in such a way that the juices and drippings from the food that is being grilled will drip unto them, thereby making them sizzle and smoke up the food, thus imparting that flavour that is quintessential to grilled food. An inbuilt thermometer: It is essential to keep an eye on the grill temperature when using it. The centrally mounted thermometer in the Weber Spirit E310 Natural Gas Grill makes this job easy as one can tell the temperature of the grill at a glance. Porcelain enamelled steel shroud: The body of the Weber Spirit E310 Natural Gas Grill looks sleek, modern and stylish thanks to the porcelain enamelled steel shroud that encases it. This shroud also prevents the unit from getting rusted, dented or otherwise damaged in any manner. Space, hooks and provisions for accessories: It is clear that the designers behind the Weber Spirit E310 Natural Gas Grill have really put in much thought and research into developing this apparatus. The two stainless steel tables that are present on the side of the main grilling grates stands as proof to the attention to detail that goes into Weber grills. These tables with integrated hooks are excellent for placing plates, tongs, spatulas, brushes and other assorted tools neatly in one place and within easy reach while grilling. 3 Burners: The Weber Spirit E310 Natural Gas Grill offers a grilling capacity of 529 square inches with 424 square inches being the primary cooking area and 105 square inches being the warming rack. The even distribution of heat throughout the entire cooking surface is made possible with the help of the 3 stainless steel burners. This grill gives a 32,000 BTU per hour input. BTU is the abbreviation for British thermal unit, which can be used to judge how fuel efficient the grill is. Grills that run on Propane have lower BTUs but for a natural gas grill, as you can see, the Weber Spirit E310 Natural Gas Grill works at an optimal rate with very efficient fuel consumption. This is definitely something to consider when purchasing a grill. Flexible hose: The Weber Spirit E310 Natural Gas Grill is highly versatile. You can place it in your patio or backyard and connect it to the gas supply with the help of the flexible hose that comes with it, which is 10 foot long. Grease control: One great feature of the Weber Spirit E310 Natural Gas Grill is its grease management. Certain foods like vegetables or lean cuts of meat tend to release very less grease when grilled. But some meats such as pork can be very fatty and they release a lot of grease when grilled. This can be very inconvenient both while grilling and also afterwards when cleaning the grill once it has cooled down a bit. The Weber Spirit E310 Natural Gas Grill has an innovative grease management system, where the grease is guided away from the burner tubes. The grease tray and the catch pan collect any excess grease and they can be easily removed for a quick clean-up. Most of the Weber gas grill reviews have only good things to say about it but it is the duty of a well-balanced review to state the downside of the product as well. One of the major cons of the Weber Spirit E310 Natural Gas Grill is that it runs onlyon natural gas. 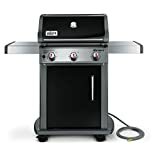 As the name indicates the Weber Spirit E310 Natural Gas Grill will work only if you can hook it up to a natural gas connection. So if you happen to have a propane gas connection in your house then you might not be able to use this grill. There could be a possible workaround to this problem if you are open to invest some time, effort and money into sourcing a conversion kit and getting a professional to convert the grill for you. Also do keep in mind that the Weber Spirit E310 Natural Gas Grill is not a portable grill that you can use on camping trips etc. It is best suited to be used outdoors in your home. Apart from these disadvantages though, it is hard to find any other bad point about the Weber Spirit E310 Natural Gas Grill. With so little to complain about, one must admit that the Weber Spirit E310 Natural Gas Grill is truly one of the best natural gas grills around. What are the advantages of theWeber Spirit E310 Natural Gas Grill over its competitors? Buying a grill can be a little confusing since there are a plethora of options available and the consumer is literally spoilt for choice. It can be somewhat overwhelming to choose the correct grill for you – one that suits your needs and preferences to a T. Hence it is imperative to read genuine reviews and recommendations and also to ask around for the opinions of other grilling enthusiasts. Let’s compare the Weber Spirit E310 Natural Gas Grill with a few other similar natural gas grills. The Weber Spirit E310 Natural Gas Grill weighs about 120 pounds, which is slightly lesser than the Weber Spirit S210 Natural Gas Grill, which weighs 130 pounds approximately. It is also lighter than yet another popular gas grill, the Dyna-Glo DGA480BSN model, which weighs nearly 125 pounds, but it is heavier than the Napoleon Triumph natural gas grill, which only weighs 99 pounds. The Weber Spirit E310 Natural Gas Grill is not one of the most compact natural gas grills to be honest. It measures 63 inches x 32 inches x 52 inches as compared to the S210 which measures 2 inches less at 63 inches x 32 inches x 50 inches. The Dyna-Glo one is wider at nearly 53 inches but it makes up for this by being only 46 inches long and 23 inches tall, while the Napoleon Triumph one is even smaller at 45 inches x 50.5 inches x 22 inches. However, please note that the Dyna-Glo model has 4 burners while the Weber Spirit E310 Natural Gas Grill has 3 burners and the S210 has only 2 burners. On the other hand, the S210 model comes with a side burner which the S310 lacks, that might be disappointing to a few. Despite this factor though it is interesting to note that the S310 still has a larger cooking area. It is 529 square inches as mentioned earlier but it is only 450 square inches in the S210 model – 79 inches lesser than S310! Unlike some other complicated models of grills, the instructions that come with the Weber Spirit E310 Natural Gas Grill are detailed, which makes the assembly easy and simple; most people admit that they have been able to set up the grill in a couple of hours’ time. So once you get the Weber Spirit E310 Natural Gas Grill home, you will be able to start grilling in no time at all! What’s more, it is easy to obtain any spare parts for this grill as they are readily available and the warranty that is extended by the company also covers most minor hitches if any, that might come up when operating the grill. 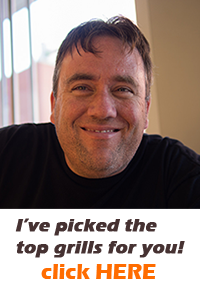 Plus their customer service is really helpful and they help sort out any issues you have with your grill politely, promptly and patiently. Natural gas grills are also far more advanced and are a breeze to use when compared to the more traditional charcoal grills which are slowly losing popularity. Don’t forget to clean and store you grill properly after it cools down in order to prolong its lifetime and also to make the next grilling session a quick and hassle-free one. Should you buy the Weber Spirit E310 Natural Gas Grill? The Weber Spirit E310 Natural Gas Grill is an ideal choice for small families to use at home for barbecue parties and gatherings. It is efficient and reliable. Although you might be able to find lower priced gas grills, the truth is that Weber has been in the business of manufacturing cooking and grilling equipment for several years now, and they are a name that you can depend on. The Weber Company assures its customers that the performance of their grills is far superior to their competitors. In the long run, the Weber Spirit E310 Natural Gas Grill will surely turn out to be far more economical and trouble-free than other similar grills that are available in the market today. Grilling should not be a hectic activity where you spend hours sweating and slaving over a hot grill. You should be able to fire up the grill and cook up some scrumptious foods without getting stressed about it and the Weber Spirit E310 Natural Gas Grill will indeed help you enjoy grilling. If you are looking for a fuss-free, low maintenance and no-nonsense natural gas grill then Weber Spirit E310 Natural Gas Grill is the apt choice for you. There are people who consistently buy only Weber grills as they are aware that they are paying for quality. In fact, not surprisingly, even people who have used other brands of natural gas grills before trying the Weber ones have been known to have become instant converts! Low quality grills can cause a lot of problems; they are not durable and do not last long, they are cumbersome to clean, some smoke far too much, can cause burns or fire accidents, some take way too long to heat up and even when they do they distribute heat unevenly thereby causing food also to get cooked unevenly, and some others are just too difficult to handle. Instead of making grilling a smooth and enjoyable experience, bad grills may end up completely putting you off grilling itself. Instead of wasting money on inferior gas grills, go for the Weber Spirit E310 Natural Gas Grill. If you have been dreaming about owning a grill and hosting your own grilling feast, then don’t hesitate any more. Head over to your nearest home improvement store and pick up a Weber Spirit E310 Natural Gas Grill. Go ahead and impress your guests with your grilling skills! You – and not to mention your guests – will certainly not regret it!Once you start using the Weber Spirit E310 Natural Gas Grill you will understand why so many people are impressed by it. Soon you will also start writing one of those positive weber gas grill reviews!